OK, UK first. All our deliveries are made with Network4 Home delivery or Furdeco Home delivery, Both are national furniture specialist 2 man home delivery services! Two trained guys in a dedicated truck will deliver your goods to the room of your choice. Please note that all wardrobes and beds are delivered and left with you unassembled. If you would like assembly for wardrobes and beds this can be arranged at the time of order, prices start from £65. The couriers will phone or text you up to 3 days before arriving and make an appointment time that's convenient with you, usually a 4 hour window of time on the delivery day. Lead times vary from 1 to 12 weeks on different items as shown in the table below and we'll also tell you about that when you order! Lead times quoted are manufacturer's current best estimates, but it's not a cast iron guarantee on occasion they can be considerably longer due to various manufacturing factors, on occasion shorter as well! Talking about lead times..........A lot of pieces we can arrange 24/48 hour delivery by courier or TNT if you are in need of finishing a project ASAP, that includes eveything from a light fitting to a Chesterfield leather sofa, obviously there is an extra cost but sometimes it's speed that is more essential! It's a geat service for the interior professional and interior designers! All our furniture and furnishings are supplied for domestic use, any used in a commercial environment with it's different rigours are NOT guaranteed for the same use. Please note it is up to the customer to make sure the furniture you have ordered fits in your property. If any piece of furniture cannot be delivered for any reason we reserve the right to leave it with you or if the manufacturer agrees to have it returned we reserve the right to charge a handling fee of 50% of the order value PLUS any carriage costs involved. *Don't worry if your order is under the minimum order value as we can still deliver to you simply call us on 01704 548176 for delivery costs. In Europe we use either TNT or Edmondson Freight. They usually use a big 15m truck (so you need parking) and just the driver (so you may need to lend a hand) but basically as long as you've got a European postcode they'll find you! They all have mobiles in UK and Europe to keep in touch! Please note that all wardrobes and beds are delivered and left with you unassembled. Under the Distance Selling Regulations (2000) any furniture order that is made to order to customer specification cannot be cancelled. However, it may be possible to alter, amend or cancel an order made to customer specifications after consultation with us and this will depend on the status of the order with the supplier. If this can be done this may incur a handling charge up to 50%. As we are nice people to deal with we do allow cancellation or amendment within 14 days from your order on furniture that is stock, i.e. not made specifically to order. We cannot usually accept any cancellations or amendments after this period nor can we accept any furniture back once it has been delivered to you the customer unless there is a fault or warranty issue. Under certain exceptional circumstances a stock furniture order may be cancelled after 14 days with our agreement. We reserve the right to charge up to 50% of the order value on any such furniture order thus cancelled. That's it in a nutshell - simple and safe! All goods are fully insured in transit and fully guaranteed for 12 months, no quibbles, no hassles.. Under NO circumstances will any goods be accepted for return without seeking and receiving approval in writing from Harvest Moon Interiors. With order by card or by bank transfer. Any agreed outstanding balances must be cleared in full before delivery / dispatch of order. We offer competitive prices for all our customers, unrivalled customer service and free home UK mainland delivery, should you find a high street shop or online retailer offering the same goods for sale we would appreciate the offer to price match. To place an order just call us on 01704 548176. Our UK VAT Registration Number is: 712 3618 61. 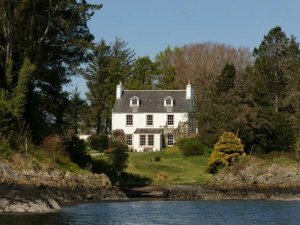 Kilbrandon House, Isle of Seil, Argyll, Scotland, 2 Tetrad sofas delivered with a smile and on time. Don't just take our word for it read some reviews from our happy customers. Hi Nigel, Just a note to say that I received the Tetrad Waffle chairs in my own fabric and I am really pleased with them. I am thinking of getting another one for my bedroom, again covered in my own fabric. "Dear Nigel, Sofa covers arrived (replacement Tetrad Alexia sofa covers) and are now fitted during the Saturday house work regime. Our Willis and Gambier Spirit items arrived this morning as planned. Unpacked and extremely pleased with our purchase. Table (Charltons dining furniture) is stunning and looks amazing in our kitchen diner. You have been great. Hi Nigel, The two items ordered (Driftwood round table and a floor lamp) arrived yesterday lunchtime. They were very well packed and were as expected from the description on your site. Many thanks for the efficient and courteous way with which this order was dealt - we shall have no hesitation is recommending your company and look forward to ordering from you again. Just to let you know the coat stands arrived by 9am next day as you said. They just add that finishing touch to our latest project here at the Institute of Directors Dining rooms in Pall Mall in London." "Dear Nigel, Following my call earlier this morning, I am writing to say how happy we were with your excellent service following our recent orders. As you know, our first coat stand arrived slightly late, just days before our own van was leaving Cambridge on its way to a client’s property in Spain. So when you managed to organise another at such short notice AND have it delivered by the bank holiday weekend, we were highly impressed with a supplier going that extra mile. We won’t hesitate to recommend your company to anyone looking for quality products at great prices, and with fantastic customer service. Thank you once again for swift service , I was again pleasantly surprised to receive my covers (replacement Tetrad loose covers) before 2016 as you predicted . "Just to let you know that the parquet topped coffee table arrived safely on Saturday morning. We LOVE it so thank you for organising everything. 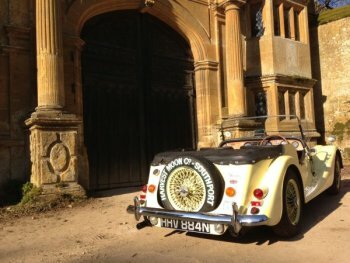 Friends will be wanting to know who we bought it from so we will pass on your details. "Hi Nigel, The furniture turned up today. thanks for all your help it looks great! When we need the next batch when we move I will pop in. Thanks. 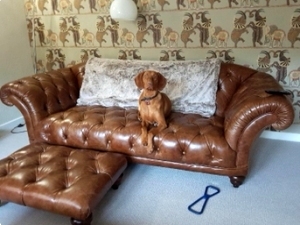 "Just enjoying my TETRAD Degas sofa which arrived this morning, the delivery men were bang on time on delivery and very helpful". "Just to say thank you for the great deal you put together for my daughter on the Willis and Gambier bedroom suite, it was a lovely wedding surprise gift for her and she is delighted." "Writing to let you know all the Bronx Oak furniture arrived today, the wardrobes in particular are lovely. Yours..."
"Just wanted to let you how delighted I am with the lamps. Delighted with the wonderful service, would highly recommend your company." Just to say thank you for arranging the replacement Tetrad cushions (to replace my old ones) and also the postage refund. Cushions have arrived safely. Many thanks for your help." "Hi!, I have just had my Concept Geneva sofa bed delivered today in Worthing and I wanted to write and say I am thrilled with it and quite taken aback by the exquisite quality! It really is beautiful. Also I would like to thank the delivery guys. This one was a tough job, and they came through. I would just like to say that I took delivery of my furniture (contemporary white high gloss furniture) on Monday and it was worth the wait, it looks absolutely stunning in my lounge and I am so pleased. I have already had several comments and just wanted to feedback to you how satisfied we are with the furniture now that it has arrived. "Tetrad covers arrived this morning ahead of my guests so thank you very much. They are on the sofa and look great." quality of the order. Many thanks." Just a quick thanks for chasing up my Sweet Dreams bed and arranging delivery in good time for my guests! Your delivery men arrived right on time, towards the early end of the range too, so I wasn't left twiddling my thumbs all day! The bed was easy to put up, of good quality and solid, just like you said it would be. Just need to save up now for the matching furniture! My guests arrive today, and I look forward to their report on the mattress! Everything looks great, though, and it was a pleasure to deal with you and your company. "The furniture we ordered arrived today. Thank you for first class service and for extremely fair pricing." I am happy to confirm that I have received my Vintage sofa and I am very pleased with it! The delivery arrived on Friday, in full as arranged. I would have let you know sooner but I have been busy as always. "I have just taken delivery of my Tetrad Eco Totnes chair and wanted to say thank you for such excellent service! Next time I need furniture I will certainly be using you again." Footstool arrived yesterday very pleased looks great thanks very much. "Thanks very much for your prompt attention. The headboard (back of sofa) did not lift off! In the end I undid 3 bolts on either side (after removing bed base) and I was able to remove both sides. This made moving so much easier and the reassembling went without a hitch. Good product - prompt service. "Lamp tables came today hurrah!! very pleased." A quick note to confirm safe delivery of the Sweet Dreams chest of drawers. It came exactly during the promised time frame and was carefully unwrapped and taken upstairs by the delivery crew. Regards and Brownie Points for a job well done." A s promised, I would like to let you know, that our sofa in the meantime has arrived. When coming back from our skiing-holiday it was already waiting in our garage. It took some time but it was worth waiting. The sofa is gorgeous. Thank you very much for your professional and uncomplicated way of handling our order and your very fast reply to every inquiry we had. "The Tetrad sofas have arrived safely here in the USA! They just look stunning and well worth the long wait of the shipping time from you in UK. All went smoothly with home delivery. "I have fallen in love with your Parisienne Dining Furniture - having spent hours looking at Next, John Lewis, Laura Ashley, and so many others recommended by patient advisors, but I disliked them all until I came across your gorgeous furniture. My son is moving out (he has bought a place but it has not been completed yet) so I will be back to purchase your stunning suite as soon as possible." Have ordered chair, thanks for a pleasant experience speaking to a very nice lady at the end of the phone. It has encouraged me to use you again." Received our new Tetrad sofa. Everything in order without any problems. Thanks for the very speedy service. mit freundlichen Grüßen | best wishes"
"We have just recieved our new bedroom furniture and are absolutely delighted with our purchase. Thank you for such an easy, stress free transaction and for the lovely case of free wine! I was hesitant at first to purchase from you as I'm a bit of an internet shopaholic and thought that having to phone you to discuss prices was far too complicated, but instead the phonecall proved to be extremely worthwhile as not only did I get a great deal (better than most other internet based companies) I also got that personal touch, fast, friendly and efficient customer service!!! Thank you Harvest Moon." "Just to let you know the new suite arrived today as promised. It is perfect. The delivery men from the Edmondson Co did a great job bringing it into my house and took all the packaging away with them. I love the suite and wish to thank you and your staff for the way it was packed up so well. "Hello Nigel, I wanted just to give you a positive feedback. The sofa arrived well. Everything went fine and it seems to fit very well, since I fell on it aready into deep sleep. Best regards"
I love your company - everything is so fast and efficient and very well priced too. Marvellous. Many thanks for the delivery we appreciate your efforts, VERY, much. The 12 pieces of Willis and Gambier furniture arrived on Tuesday night. Trevor and David did an excellent job and we felt sorry they had to go back immediately. We are very happy we did this business with Harvest Moon. We will recommend you very widely." "I would just like to say thank you for all the help that you gave and the contact you made regarding the sofa bed that we ordered. When it arrived I didn't think it would go up the stairwell, our house is very small, but we managed it. Tom has had it for a week now and finds it very comfortable. It looks great in his room. Once again, many thanks." "Thanks for the sofa order, it arrived on time and is beautiful." "I took delivery of my wine table today. Just a quick line to say "thank you". I am delighted with it and have found a great spot for it in my living room! It was extremely well packaged too! Thank you for meeting the price that I was after too. I shall certainly be in touch again with you should I need any other furniture that you supply!" "Hi Nigel ..... My Felix Monge cabinet has just arrived, FanTastic! My wife loves it, Happy Days. "My father recently purchased 2 bedside tables for us to match our Willis and Gambier bed, they were received today and are fantastic, thank you!! Could you please give me a price on the matching 7 drawer chest including delivery?" Just wanted to say that our bed arrived as promised yesterday. The delivery men were excellent, very polite and professional, unpacked and removed all packaging and the bed itself is excellent and overall I'm delighted with the product and service. Hopefully we'll be ordering from you again very soon. Just to say how fantastic my new Tetrad Degas sofa is, it arrived in only 6 weeks and the lovely delivery men put it in my lounge just where I wanted it. Once again thanks. Greetings from Spain, sitting on my new sofa, lovely! Just to say thankyou for the great service we have received. We are over the moon with Harvest Moon!!! and my honeysuckle is to die for. SHINE ON HARVEST MOON! Just a quick note to say how delighted we are with our new sofa bed all I expected and more! Thank you also for the swift delivery of wine, we enjoyed the odd glass or 2 over the weekend. Should have contacted you earlier to thank you very much for delivery of beautiful furniture. It is truly gorgeous and I absolutely love it. "Well if I had a complaint I would make it very strongly! On the reverse it is only fair to say when things are good - so many thanks. The chairs arrived safe and sound and we're delighted with them. We're very impressed with the service, especially as I ordered the wrong colour - thank goodness you were "on the ball" and phoned back. Could you imagine my horror when the delivery men opened and they'd been"grey" oh dear! On the subject of the delivery men they also deserve a "pat on the back" as they were very polite and efficient. Once again, many thanks. I will certainly pass on your company details to anyone who admires the chairs. "I have just completed reading everything on your site. I have looked at every picture...it is excellent..so easy to read and so easy to see the pics...lovely experience...beautiful stuff..."
I ordered Willis and Gambier furniture from you on the 10th July and it was delivered on the 5th September in accordance with the time scale that we agreed upon, when the order was placed. When the delivery company phoned regarding the delivery, the suggested date clashed with an appointment for me to see my doctor. When I explained this to the lady that phoned she could not have been more helpful. She said that she would ask the delivery men to try to avoid delivering the furniture between 10.30 and 11.30 but if they were unable to do this they would wait outside until I returned. On the Tuesday the delivery van arrived at 9.45 and I asked the driver if they could take the furniture upstairs to my bedroom, which he agreed to do. When the driver and his mate got the furniture upstairs they unpacked it in the presence of my wife and myself, put the furniture in situ and removed all of the packaging materials. During this process what really impressed me was the way that the furniture was packaged which, combined with the care taken by the delivery men, meant that the furniture was put in place with no marks or scratches. My wife and I are delighted with our new furniture and we would certainly have no hesitation in recommending your company to our friends and family.